The title of this entry is not a question. It is an expression of disbelief and in some way in amusement at how the powers that be deal with one of our basic necessities in the modern day. Firstly, the far-reaching hands and mighty government of the day must take good care of the welfare of the people to ensure good quality of life. Secondly, for an oil and gas producing country such as Malaysia, it is obligatory for the government to provide for a reliable and affordable supply of electricity to the people. Not my saying. I was trying to put myself in the shoes of those opposing "resiliently" the idea of power tariff increase. I am NOT against the idea of increasing the rate. If done the right way, and I'm not going to elaborate what is that right way, I am all for it. All for it? That sounds a bit on the extreme but what I'm saying is that I will agree to a properly drafted revision, that's all. I am a consumer just like all of you and I don't want another hole in my already shallow pocket. But why not? All good things like cheap stuffs will come to an end someday. So is our cheap electricity. 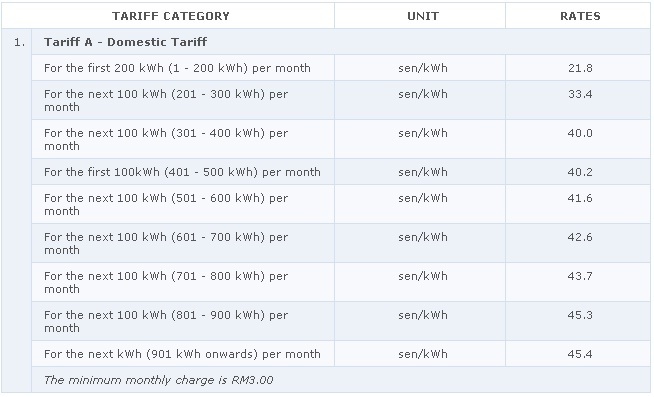 If you google enough you will find that Malaysia's power cost is one of the lowest in South East Asia and Sabah's SESB electricity tariff is still low compared to Sarawak's SESCO and Peninsula Malaysia's TNB. SESB rates are however less interesting as it lacks the peak hour variaty and industrial sector has less 'optimazation' options. You can compare electricity tariff of ASEAN member countries in what Beni Suryadi compiled here. 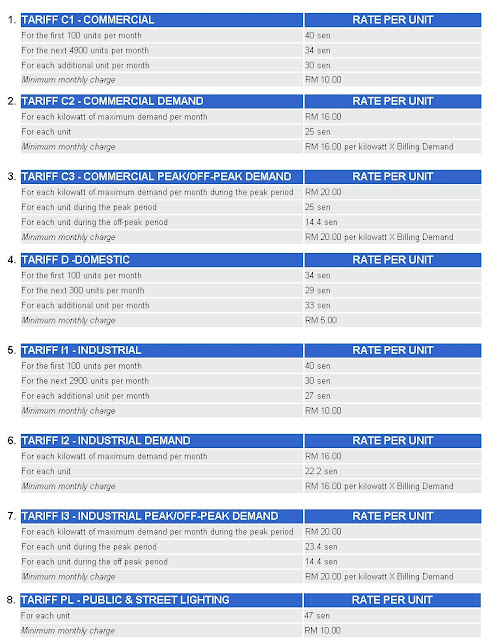 For industrial, commercial and others, visit TNB Industrial Tariff here. 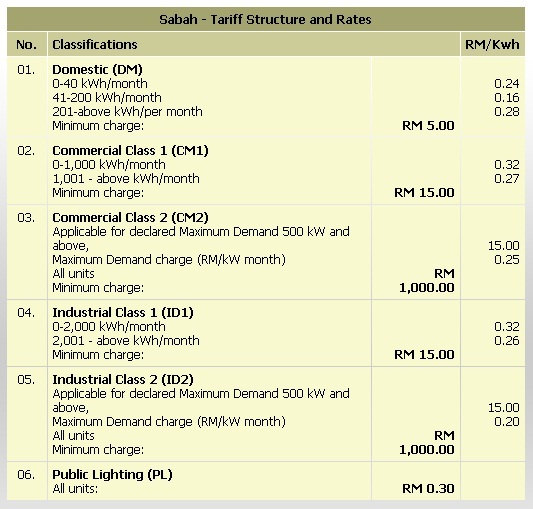 TNB have just announced its tariff restructuring and SESCO did it in 2007, while SESB's last revision was about 25 years ago. To be fair to SESB based on the timeline alone, I'd say review is overdue. 1. Not equate low tariff to unreliable supply. They are not the same although we hear poorly-advised leaders claiming so. 2. Translate low SAIDI to real life elimination reduction of power supply interruptions. I can give monthly data for power interruptions of several West Coast city/townships in Sabah if required and I'm not at all impressed. Three to four power failures in a month is not uncommon and this rate would drive some people nuts if it happens to TNB facilities. 3. Beef up its power theft eradication Task Force. 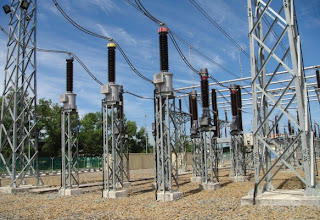 Do you know that SESB is losing some RM3mil in revenue due to power theft? Some one can set up a SME entity and work around this figure to provide SESB with solution, in my humble opinion. 4. Be transparent. On how SESB manage itself is none of my business. What I hear on a daily dosage is complaints and all sort of allegations (both baseless and those with facts) by certain quarters. So, do what you need to do and what needs to be done. You do have a lot of wise heads in your organisation. Talking about SAIDI (average power outage/blackout duration for each customer), TNB's record for the last two years was around 70 minutes. Our neighbour, Singapore records an average of 2 minutes (check it out Here and scroll to page 19) per customer. SESB recorded 867.4 minutes per customer last year. That's ten times of what was recorded in Peninsula Malaysia. Compare that with those of Singapore's! Are you happy with what you see? 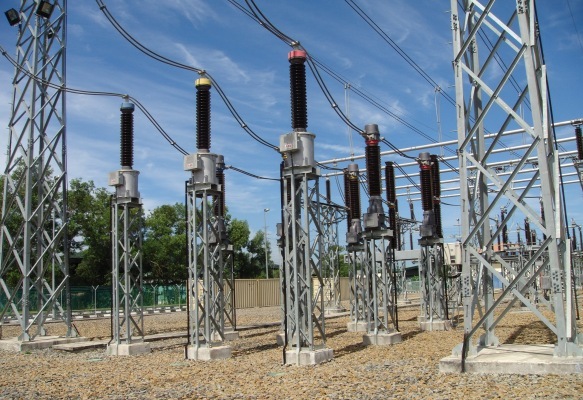 Are you happy with the frequency of power outage in Sabah? I am not. Again, don't equate LOW TARIFF to UNRELIABLE power supply. Of course, having more money will solve many supply issues but I can't see it as the sole justification for increasing the power cost. It is how efficient you manage the resources that matter. Finger crossed SESB will come good. I do agree with your points here. It's unfair to increase the tariff without solving the supply interuption problem first. I don't mind paying more if that's what I have to do, but I want quality for the price I pay. When I was still in Tambunan (last year), I remember being left wondering 'what's wrong' with SESB in Tambunan if we had 5 days uninterupted electricity supply in a row. They are not usually that good. I presume you work for SESB? You seem to have a lot of knowledge about eletric field related. I only have three points to point out; One for thumbs up, and two for thumbs down. 1. Electrical power failure incident is quiet unpleasant. 2. Some places especially in rural area are not supplied with good electrical power services; No power, 12-hours only and so on. Gunaqz > I know they are improving, but at snail pace IMO. I'm not working for SESB but I'll monitor them closely. Andrik > nice blog u have too. Love the food photographs you took. Good ones. samizul > If the urban area is already bad enough, I can imagine the worse for rural area. BTW, I can't seem to get in the BAKUN link you gave here. Nowadays Electricity powers are not satisfied in our side.I think they should take more units from other cities.. 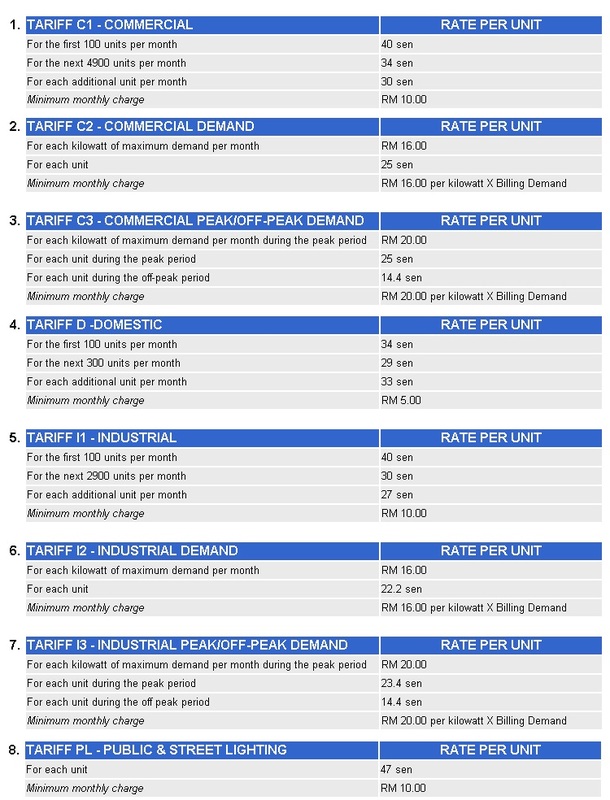 This is great information about electricity tariff..
WD Qatar > you mean your cities are not grid-interconnected? Yeah, that's true. Perhaps in future we all, either in urban or rural area, need additional power supplier such Solar Hybrid Technology. Sorry for the broken link. This is what I meant before..
Alternatively, you can visit sabahkini.net and type 'bakun' in the search menu..
samizul > thanks for the link. Interesting perspective form the opposite fold. The author discussed things in a very general manner and i tend to take them with a pinch of salt.